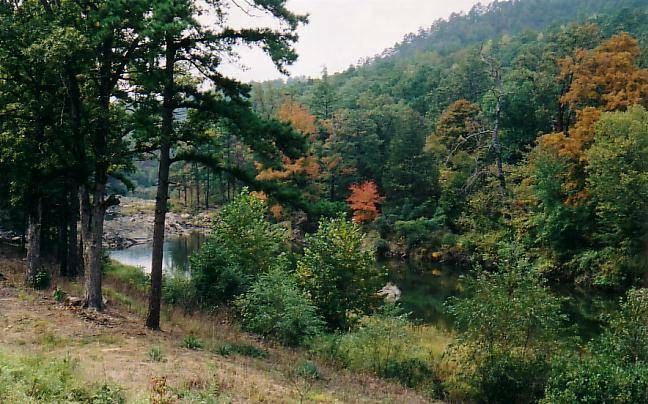 This is a view along U.S. Highway 71 in western Arkansas. 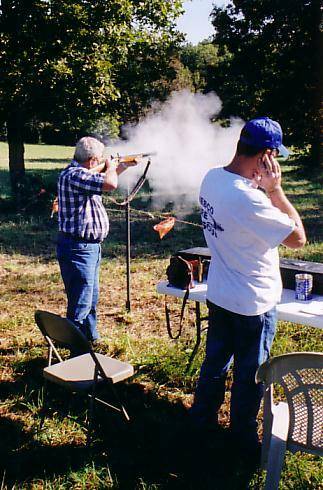 When we went to Springdale after a World War II memorial program at the University of Central Arkansas in Conway, Ann said I was supposed to go to a Turkey Shoot with Ray, her brother-in-law, and take pictures of him as he was shooting. 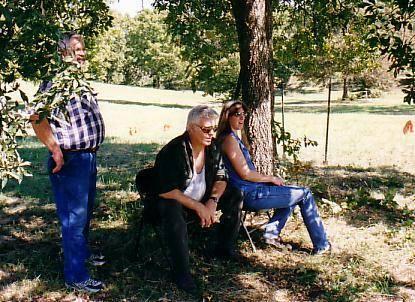 We left Saturday morning for Garfield, Arkansas, in the northeast corner of Benton County near the Missouri border- about a thirty minute drive. (It surely was named for President Garfield, not Garfield the cat.) Ray took his muzzle-loading rifle and some other guns and went over to pick up a neighbor couple and their guns. 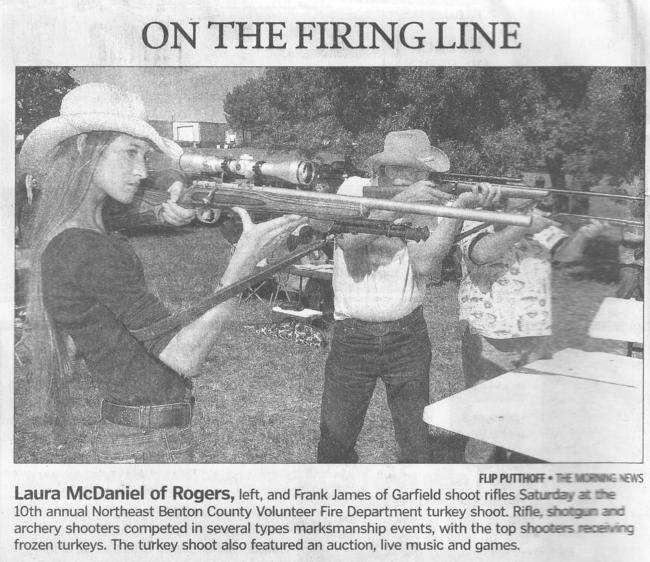 The turkey shoot was a fund-raiser for the Northeast Benton County Volunteer Fire Department. 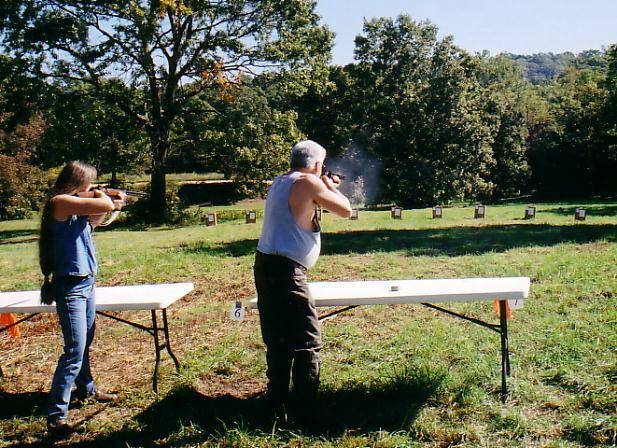 Northwest Arkansas is in the beautiful foothills of the Ozarks and the turkey shoot was held in a beautiful area just off the highway. They had four ranges set up. One was for bow shooting, one for muzzle loaders and large rifles, one for small target rifles, and one for shotguns. 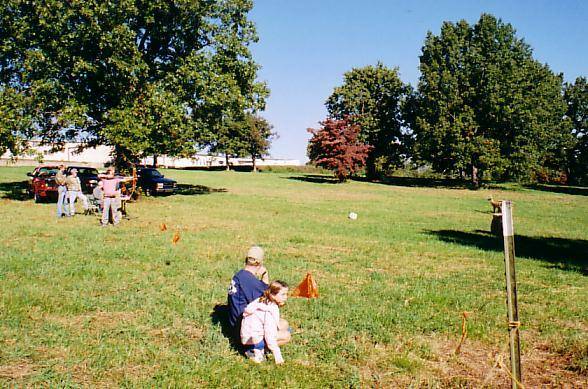 I didn't find out the details on the bow shooting, but here is a picture. 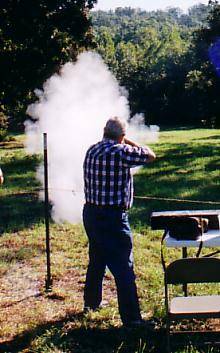 The muzzle-loaders shot at a 4" plastic disk hanging from a length of monofilament line at a distance of 100 yards from the firing line. I think they got one shot for a $2.00 ticket. Ray tried several times and his son and Dan did too, but they didn't win a turkey. The small rifle range had a poker hand contest. Ten shooters shot at 81/2 by 11 sheets of paper at a distance of 35 yards. One side of the paper was marked with a 6x9 matrix of 1.4"x1.2"squares marked with card symbols. Each shooter was allowed five shots at the blank side of the paper. In each round, the shooter with bullet holes marking the best hand of five card symbols won the turkey. Added 12/22/12 -- I'll point out that the shooting had to be done "off-hand." One young guy started to set up a tripod on the table, but the officials told him he couldn't do that. Also, they didn't actually explain how the "cards" would be counted, and one guy thought that five individual cards (the 1.4"x1.2" squares) had to be hit. I don't think anyone knew what the card pattern ways, and the officials took the wining targets for some reason. I just assumed that putting shots in the center of the target would be the way to go. 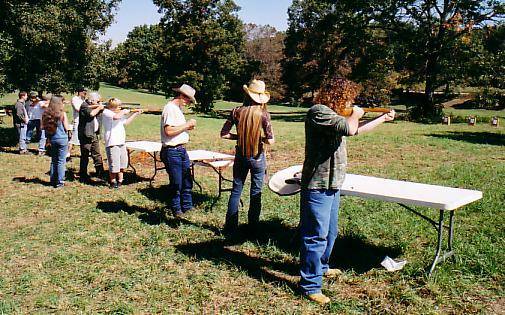 The shotgun shooters shot one shot each at regular bulls-eye targets at a distance of about 20 yards. The one with the most shot-holes in the bulls-eye was the winner. 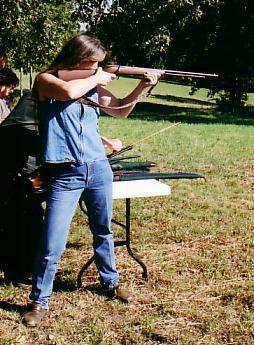 Tammy was shooting a 1922 Winchester 22 target rifle in the 'poker shoot.' She won a turkey after only a few tries. Dan came over from the muzzle loader range to try his $1000 big bore rifle, but it seemed to be sighted-in for a greater distance and he didn't do too well. My understanding was that Dan's rifle was a Sharps, a modern version of the rifle used so successfully by Quigley in the movie Quigley Down Under. I think it was about a .40 caliber and there was no problem seeing the holes it made in the target. After Tammy tried a few times, she asked me if I wanted to try. She said I could use her 22 and she'd give me a ticket and five shells. 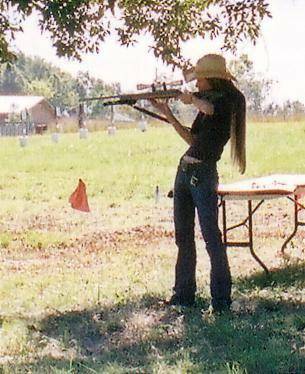 She even loaded the rifle for me. My first shot was near the right edge of the page (I could barely see the hole and another young man was using a spotting scope to check for hits), but my next four shots were right across the center. I put three shots in the center square, which was an Ace, and the other was a King in the next square. I had three Aces, a King, and a 2 or something. That was the top hand for that group of ten shooters so I won a turkey! I tried once more, but my shots were scattered a little more. I bought some more tickets for Tammy to use, but the turkeys that she and I won were the only ones we took home! Tammy exhibits her winning form. I don't know how the other girl did, but she attracted the attention of the newspaper reporter. This is a scan of a small part of the center of the photograph I took from some distance away. This excerpt from the local newspaper illustrates the type of local reporting that small local newspapers can do. There was plenty of shade for taking a break. The fire department sold a nice lunch of fried chicken strips, baked beans, and coleslaw at a reasonable price so we had lunch there. They were auctioning off some donated things, but we didn't stay for that.